Most series will usually feature an OVA in the form of lighthearted entertainment or fanservice. 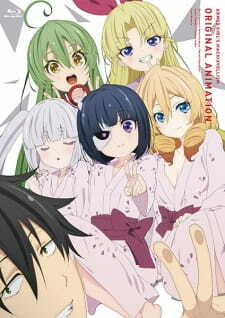 Busou Shoujo Machiavellianism is no different, as this OVA, came bundled with the original manga, is your standard "school trip to the Onsen episode". In other words, a fanservice episode. And if it wasn't obvious enough, then looking at the thumbnail should provide some additional insight. This OVA is a direct sequel to the main series. As far as fanservice episodes goes, this one was boring and not very entertaining. The first half of this episode featured boring dialogue and a study event where Fudou Nomura must pass his exams in order to go on the Onsen trip, but, as usually, he passes the exam. And, then the second half involved a "typical" legend about the Onsen, i.e., the first person to enter the Onsen gets their wish granted, and brief fight scene over which girl will enter the Onsen first. Overall, a boring fanservice episode. The art, background settings, and character designs were all pretty mediocre. There was a short fight scene, but it wasn’t very impressive compared to the main series’ fight scenes. There was nothing impressive or noteworthy that stood out to me. We have the same voice actors and actress reprising their roles. And, we have the same opening and ending song from the main series. Don’t expect any character development or additional backstory. If you have seen the main series, then you will know who these characters are, their personalities, and how they will behave. Furthermore, you can expect the same cheesy dialogue and bad jokes. It was boring and not very entertaining. Generic fanservice for an overall generic show.